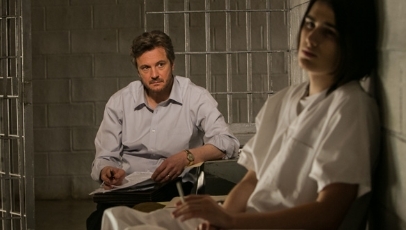 Canadian director Atom Egoyan’s attempts to dramatise Mara Leveritt’s novelisation of the previously well-documented story of The West Memphis Three is an unfortunately dull, melodramatic and calculable procedural. When three boys disappear, only to be found brutally murdered days later, the authorities’ hold three satanic cult members – Damien (James Hamrick), Jessie (Kristopher Higgins) and Jason (Seth Meriwether) – accountable, even though the evidence isn’t all there. The true story is undeniably a fascinating one, yet Eyogan has stripped Devil’s Knot clean of all that and fashioned a run-of-the-mill TV movie in its place. Severely lacking in depth and or characterisations, the film unfolds systematically, with screenwriters Scott Derrickson and Paul Harris Boardman erring too much on the side of caution, so as not to limit its scope. As if that wasn’t bad enough, Egoyan captures the whole film in such a bland washed out manner, that even the tried efforts of Reese Witherspoon as one of the dead boys’ mothers and Colin Firth as a pro bono private investigator for the defense, who deliver so-so performances, fail to raise the momentum whatsoever. An extended version of this review was originally posted on CineVue. Sounds disappointing. Was The Sweet Hereafter the last really good Atom Egoyan film?